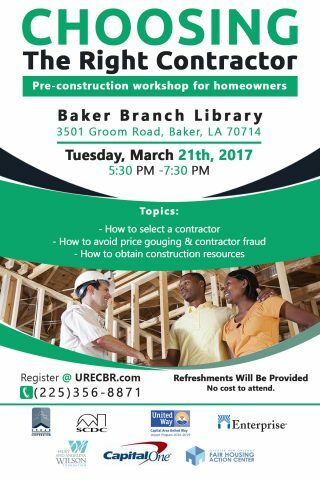 Urban Restoration Enhancement Corporation in partnership with Capital One Bank will host a free Choosing The Right Contractor Seminar, on Tuesday, March 21, 2017 from 5:30-7:30pm at Baker Branch Library, 3501 Groom Road, Baker, LA 70714. Pre-registration is required for the event. Please complete the online pre-registration form below. There is no cost to attend. For more information, call (225) 356-8871.